Well, it matters to the IRS — at least at the start of your career or when your income drops — and it should matter to you. Unless you’re at the stage of your writing career where you generally show a profit — in which case, this doesn’t matter to you, because you’re clearly a business and have already proven it. This is more for those writers at the start of their career, where they may put more money into covers, editing, etc. than there is income. Also not applicable if you’re incorporated, because then you are, by definition, a business entity. Profit — which is where your income is greater than your expenses and you pay taxes on the difference. This is where we want to be, obviously. Loss — which is where your expenses are greater than income. Startup — which represents all of your expenses prior to being “open for business”. The Hobby vs. Business question has to do with that second state — showing a loss for the year. It’s normal for some businesses to have losses in the first year or years of operation. Your author business is no different. If your series doesn’t take off until the third book, and you’re writing one book a year, then your first two or three years could operate at a loss as you put money into covers, editing, and advertising, as well as maybe going to writing conferences and conventions to improve your craft and promote your work. What happens with those losses is the Hobby vs. Business question. If your writing is a hobby, meaning that you’re not running it as a business or trying to make a profit, then you eat those losses. You can only deduct expenses up to the amount of your income for Hobby losses. Make a $1000 but spend $1500 on editing and covers? You can only deduct that $1000. On the other hand, if you suffer a loss in a year and your writing is a business, then that loss can offset your day-job salary income and you pay less in taxes on that. How do you show that your writing is a business and not a hobby? By treating it like one — and, first, not saying things like “I just do it for fun” or “I’m happy if it pays for dinner once in a while” — but basically by showing that you’re trying to make a profit, even if you haven’t done so yet. Keep your business and personal money separate. Separate bank and credit accounts. These don’t have to be “business” accounts, but can be personal accounts you only use for business. If you’re putting salary income in to pay for editing or such, then transfer it to the “business” account and pay the editor from there. Same if you’re buying something personal with your royalty income — transfer it to the “personal” account and buy it with that card. Keep good records of your income and expenses. I like Quickbooks Self Employed for this and recommend it highly. Time and effort. Track how much time you spend on writing, marketing, and improving your craft. Have you tried different things to make a profit? I.E. changing up your advertising or writing in new markets because they might be more profitable. Were the losses during the startup phase of the business? I.E. Before you publish your first book? Basically, you have to be able to argue and show evidence that you take your career as an author seriously, and are taking steps to achieve profitability. Like too much of the US tax code, though, it is subjective, so do everything you can to document that you’re treating your writing like the business it is, and not just a hobby. Now, that third state, Startup, defines the time before your book is for sale — before you’re “open for business” — and for a regular business, those startup costs would have to be capitalized (meaning the amount is deducted over a number of years). 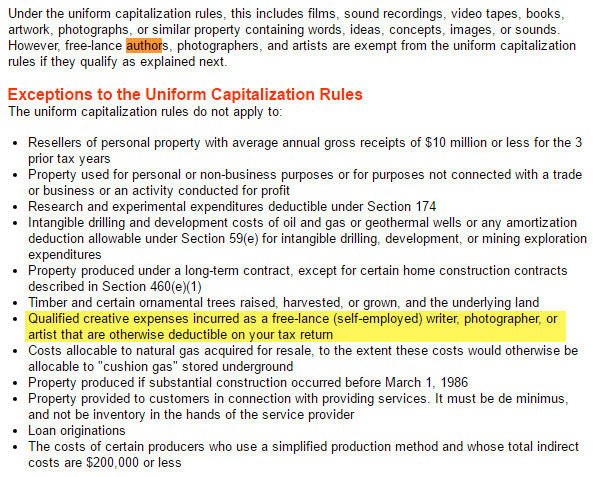 Some tax professionals say this applies to writers, but the IRS appears to say differently. But once you’ve published something and put it up for sale (or sold something, if you’re going the traditional route), it could be argued that you’re “open for business” forever thereafter as a writer and don’t have to worry about this — you just make a profit or loss in any given year. Before that? I think it could go either way, but I lean toward the “expenses” rather than “startup costs” camp, because of this exemption. There’s also the question of how this applies to the traditional publishing market. Are you “open for business” when the public can buy your book or when a publisher can? Does the act of shopping your manuscript or sending a query letter open you for business and end the startup costs question — if it even applies to writers? I don’t know and you might want to query more than one tax professional — preferably those who have dealt with it before, so you’re not getting someone’s first opinion. For me, I went the expenses route, but I published within the first year, so didn’t have the multi-year question to deal with.